A few weeks ago it occurred to me that, at the grand old age of nearly 57, I have never walked along a river from its source to its end. I have always wanted to do this with one of the great rivers of the world: the Nile, say, or the Orinoco, or the Amazon. Or, failing that (and I’m sure there are logistical reasons why you can’t actually walk the length of any of the rivers mentioned), I would like to walk the Thames. Well, not much chance of that at the moment either. 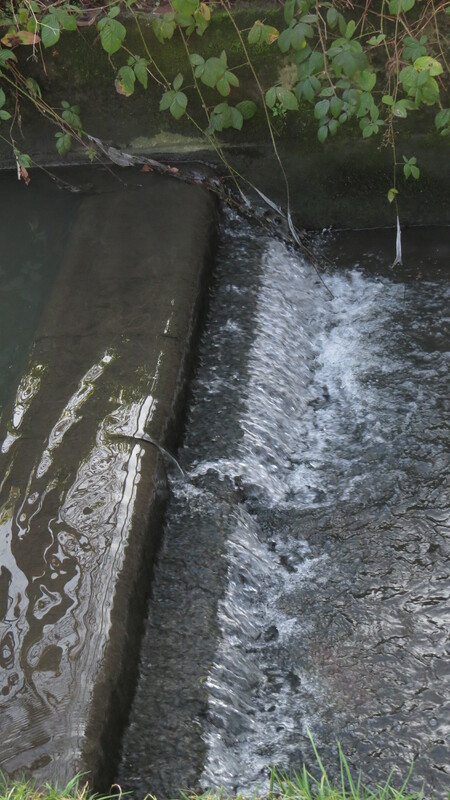 So, how about a much more local stream? 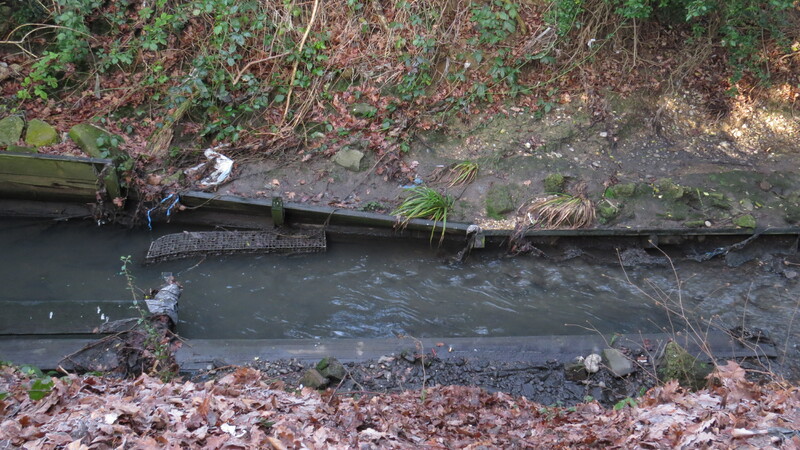 The Mutton Brook is East Finchley’s own river. 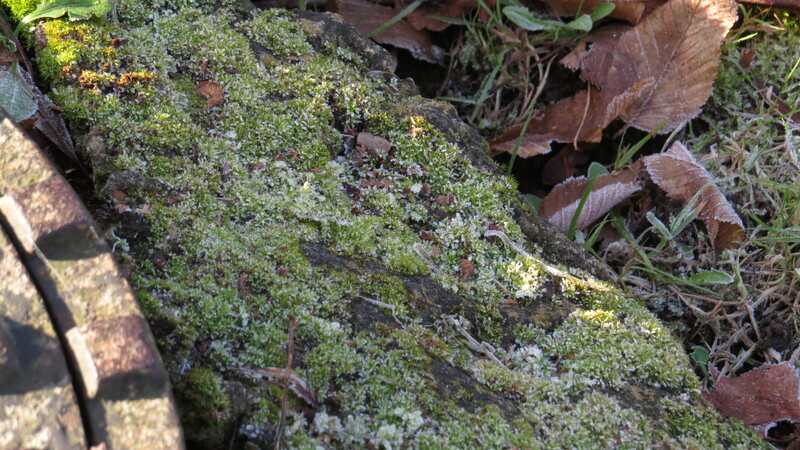 It is said to ‘arise in Cherry Tree Wood’, though previous visits had left me a little puzzled about that. 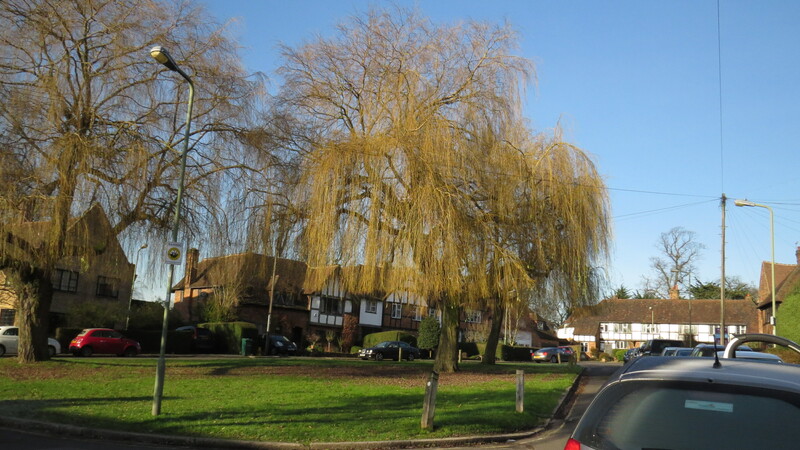 Then, it flows through Hampstead Garden Suburb and skirts the edge of Temple Fortune before meeting up with the Dollis Brook and becoming the River Brent, which empties into the Thames. 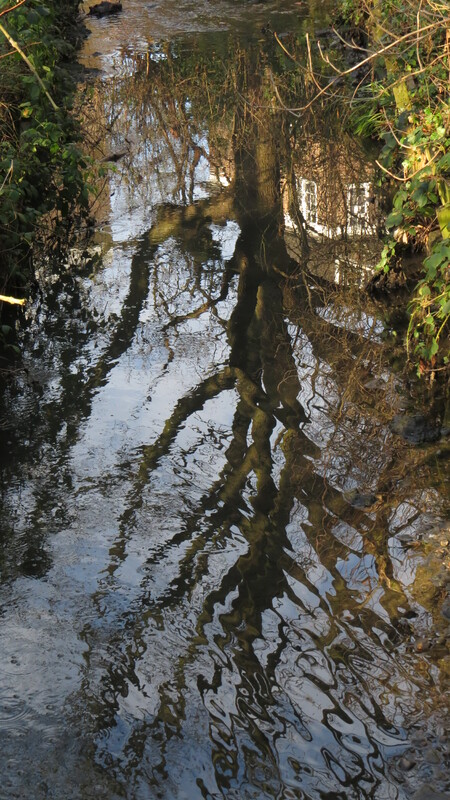 Today being a bright, cold day, I decided to follow the river as far as the Dollis Brook, and just see what I could see. I left behind my pith helmet and took my camera and a copy of an old map of the Suburb to help with navigation. Well, the first challenge is finding where exactly the Mutton Brook arises. 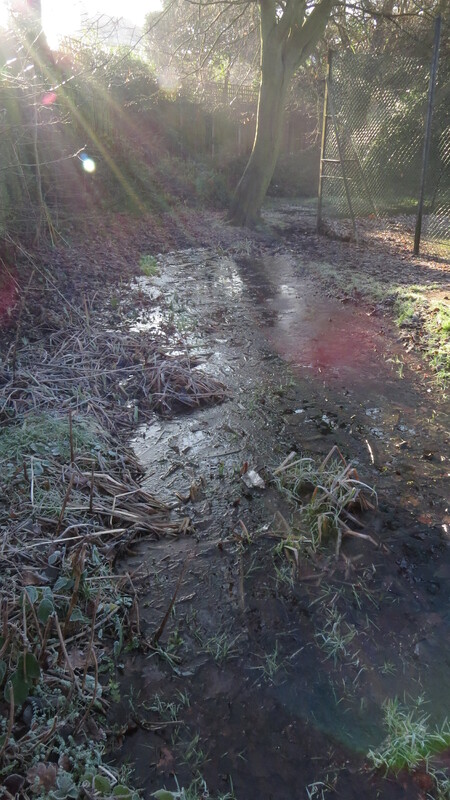 Cherry Tree Wood is notoriously prone to dampness and becomes a bog with little encouragement: the Summer Festival of a few years back had to be cancelled because of the quagmire, and watercress used to be grown in the stream. The theory is that it was called the Mutton Brook because drovers bringing their animals to slaughter at Smithfield would water their sheep here. But where is it within the wood? There is no obvious brook anywhere. My guess is that the river starts somewhere behind the tennis courts. This area is always damp, and there are often flag irises growing, along with other bog plants. 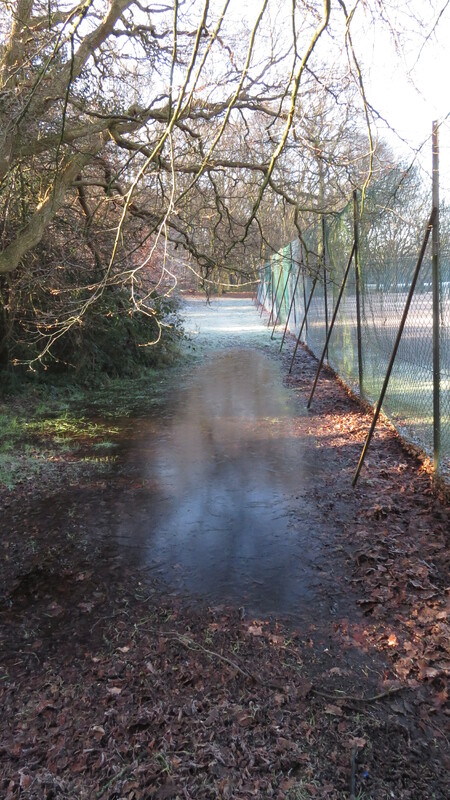 You can follow a path of muddy puddles right along the edge of the wood itself, past the football fields. 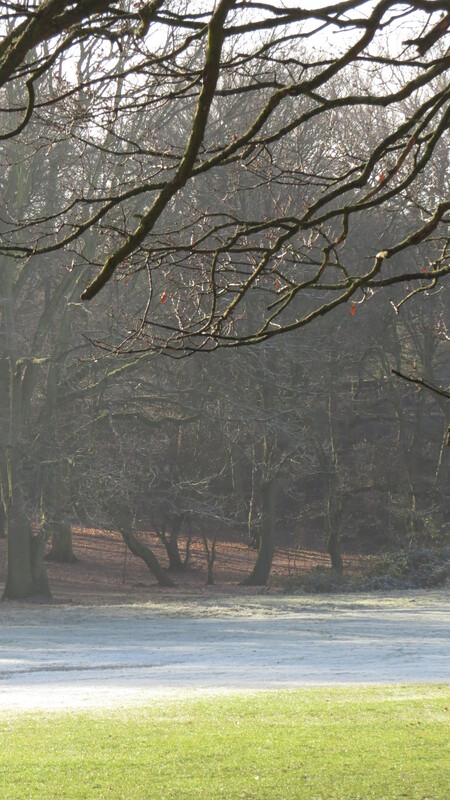 This morning, some areas give an ominous creak when I stand on them, as if the ice will break and I will be plummeted into the mud below. A man slides backwards and forwards on one of the more extensive puddles, and so does a small, hairy dog. 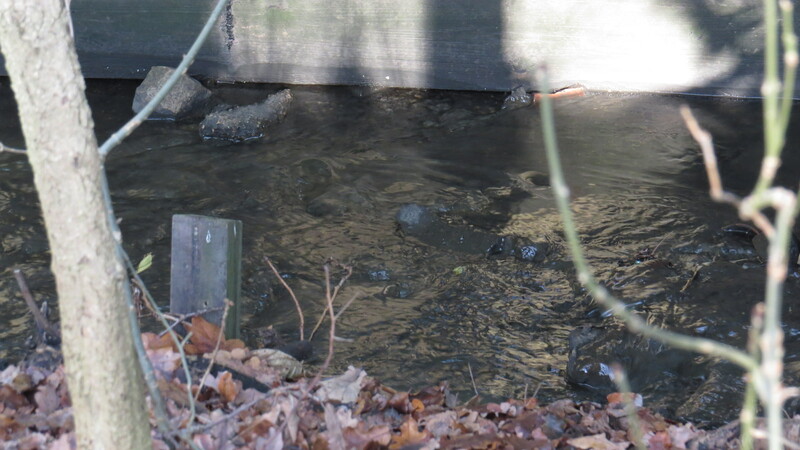 But the clear evidence of the stream is hidden away. I have missed it numerous times when I’ve been in the wood, and it was only the sound of running water that alerted me to it today. 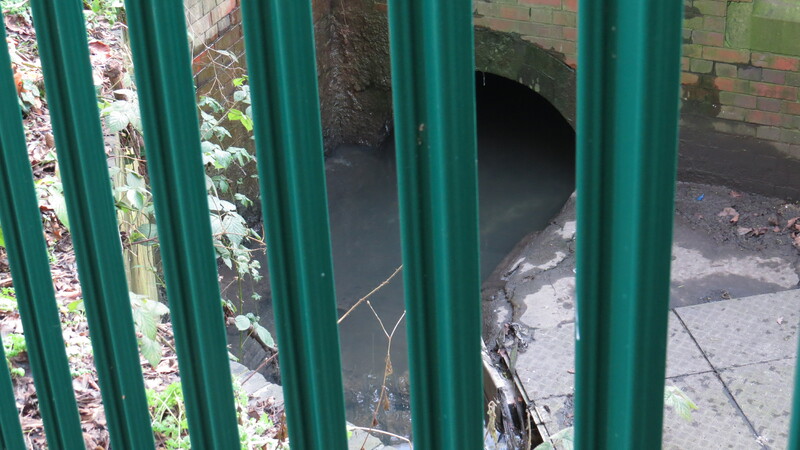 Beside the tube line, surrounded by undergrowth and a green metal fence, a stream runs down a concrete culvert, and is directed sharp left under the embankment. It’s the last time it will appear above ground for over a mile. I have an old map of Hampstead Garden Suburb, which clearly shows that the Mutton Brook reappears on a road called Vivian Way. I cut round behind the station, passing along Edmund Walk and emerging into an area of Tudor-themed suburb houses. There are some magnificent weeping willows in the middle of the green here, and I wonder if they are tapping into hidden water. I always find interesting garden plants in the suburb, and today is no exception. 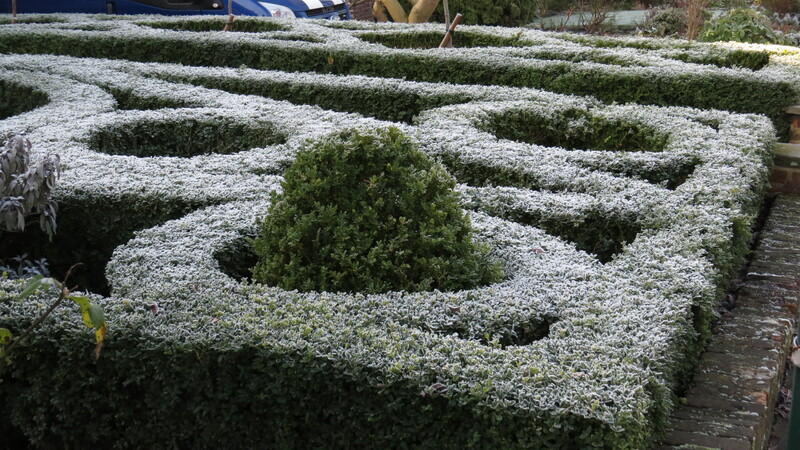 There is a lovely frosted knot garden, and a very interesting legume – if anyone knows what it is, do tell me! 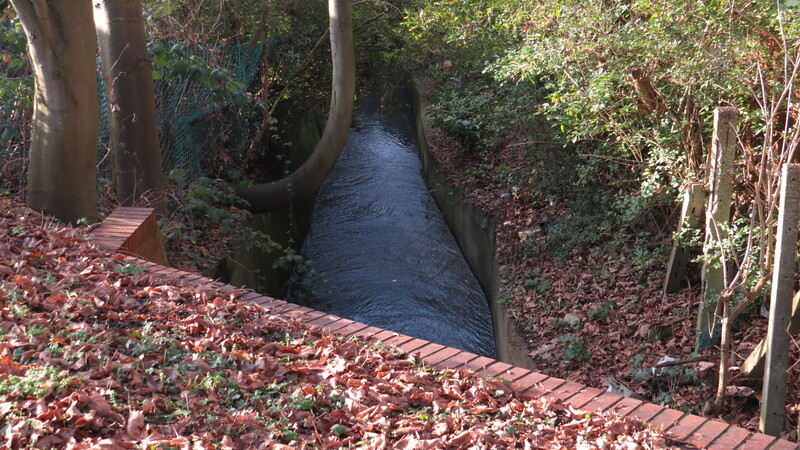 When I get to Vivian Way, I can find no sign of the poor old Mutton Brook. 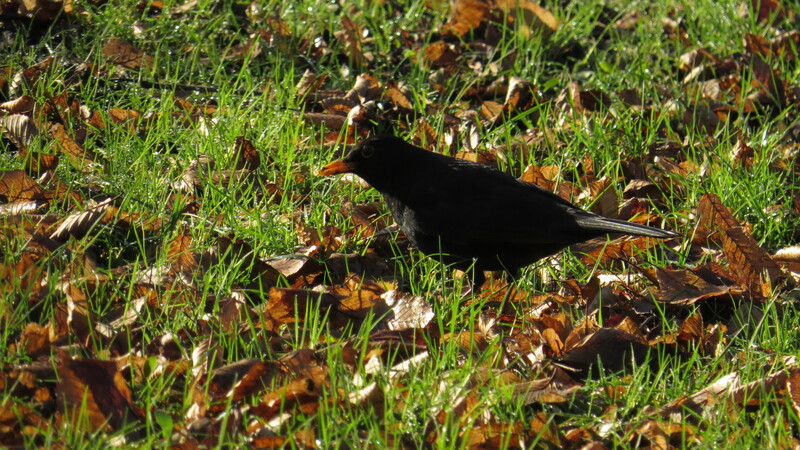 The green, where it is supposed to run, comprises a lot of grass, three birch trees and a hungry blackbird. There is, however, a huge manhole cover plonked down in the middle of the area, and it occurs to me that maybe the stream has been taken underground here, but can still be inspected via this access point. 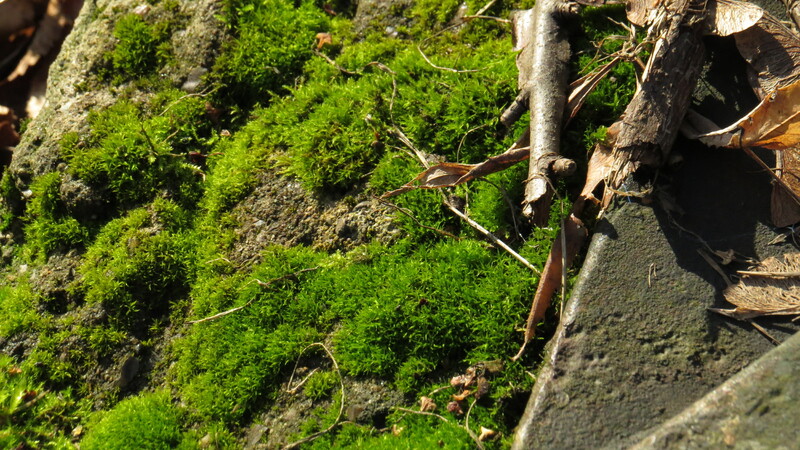 The manhole cover itself is a miniature garden, moss on one side, lichen on the other. 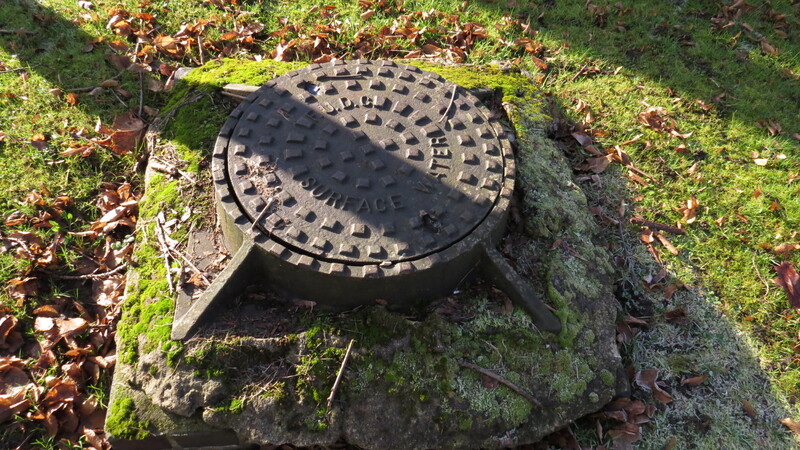 One side of the manhole cover….. I am always surprised by how quiet the Suburb is during the day, especially after the relative bustle of East Finchley. I’m sure that this calm was something that the architects of the scheme wanted to achieve, and I know that there is a thriving community here. However, there is something a little spooky about it too. In my entire walk I saw only a handful of people. I cross the main road, and head up Norrice Lea. The synagogue and the Jewish school are here, and there are usually security guards, as there are outside the nursery school that I pass later. It distresses me that this should be necessary, but I understand the need. 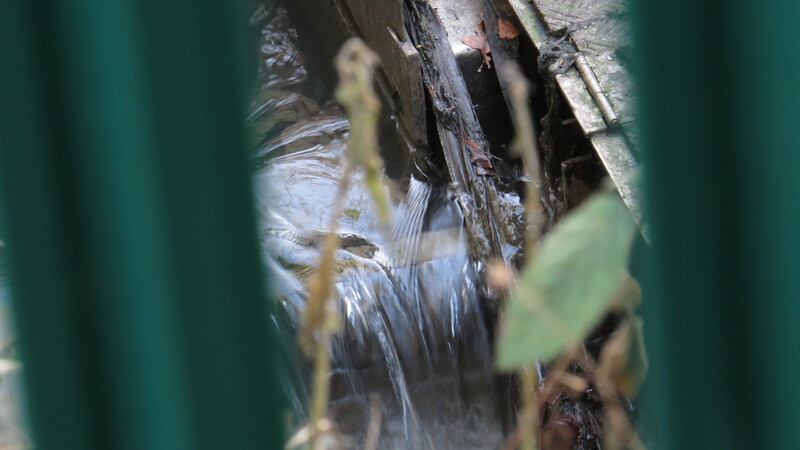 I try to look as inoffensive as a middle-aged woman carrying a camera can look, but just before I get there I notice the Mutton Brook has emerged from underground and is tumbling under my very feet. To follow it, I have to head into Lyttleton Playing Fields, where a small Chinese man is doing his morning tai chi in spite of the cold. I find the stream behind the tennis courts (again). On the other bank there are some rather fine mansion blocks, but it’s a sad little river here: confined between beaten up pieces of wood and crumbling concrete walls, and smelling slightly of sewage. 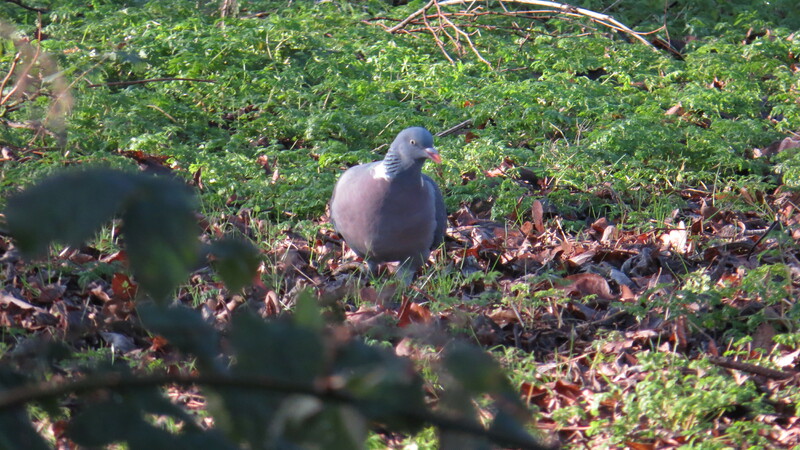 The banks are mainly bramble and cherry laurel, and there is rubbish bobbing along. At one of the bridges (and at several other points along the brook) there is clear evidence that it occasionally floods, and that the banks subside – I’m very careful not to get too close to the edge along this part of the stream, as there are several places where the soil has fallen in, and I don’t want to follow. There are some magnificent oaks and hornbeams along this stretch, their branches stretching over the path like tentacles. 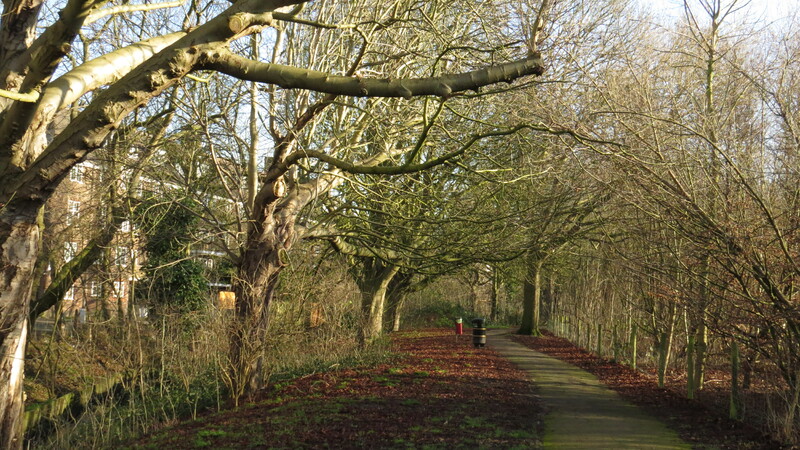 Shortly, I come to Kingsley Way: the brook leaves the playing fields and flows on into a little ornamental park. There is a measuring device here which I find very puzzling. 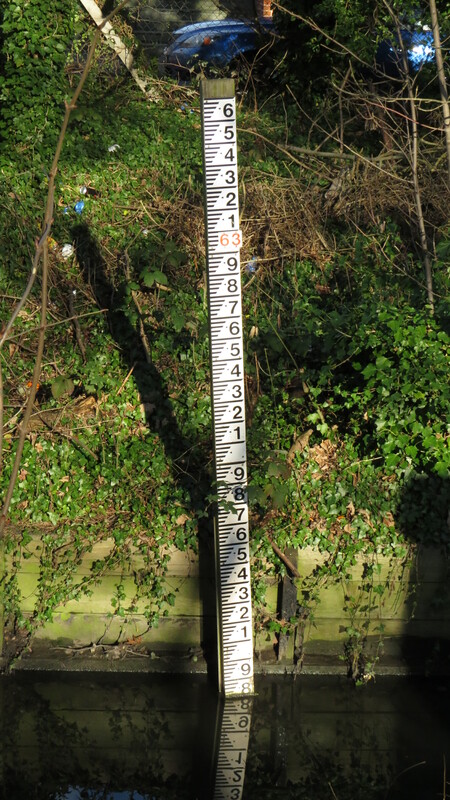 It looks as if it measures the depth in metres, but it has ‘63’ in red letters at the top. This is about the same height as the bridge, which could well be 6.3 metres from the base. But how high does the river actually rise? 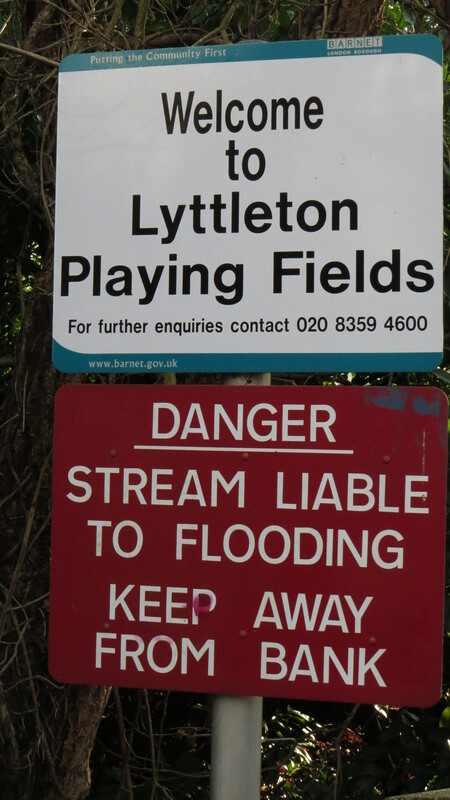 I must pay attention and see how often, and how badly, the Mutton Brook misbehaves. Once the brook emerges from under the road, it takes on a completely different character. The stream meanders through a narrow channel, burbling to itself as it goes. 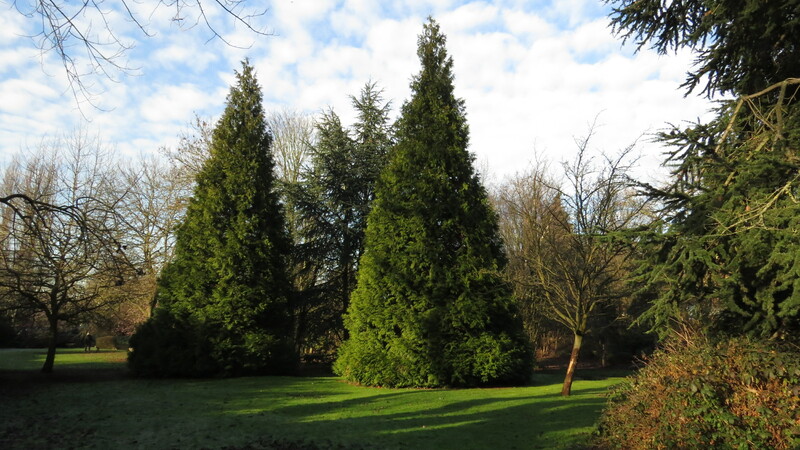 There are some fine specimen trees here, and a robin seems to be singing from every one. 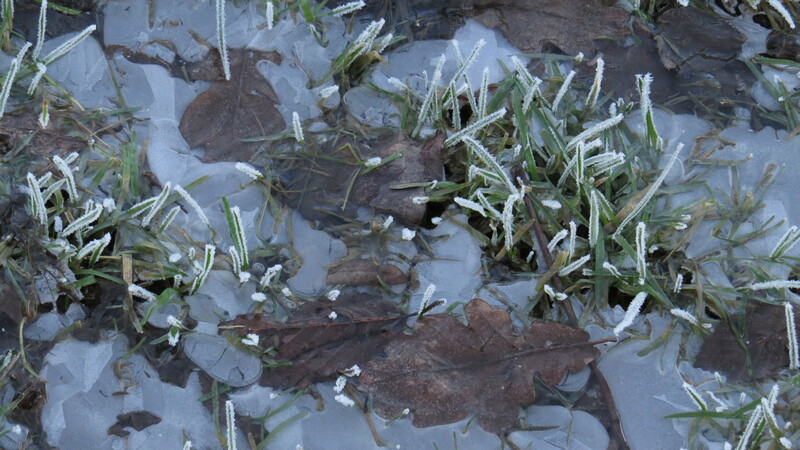 The grass is still frozen, and crunches underfoot. A French Bulldog in a jumper goes careering past, dead leaves flying around him. And as I get to the end of the park, where the river goes under another bridge, I am stopped in my tracks by a delicious smell. 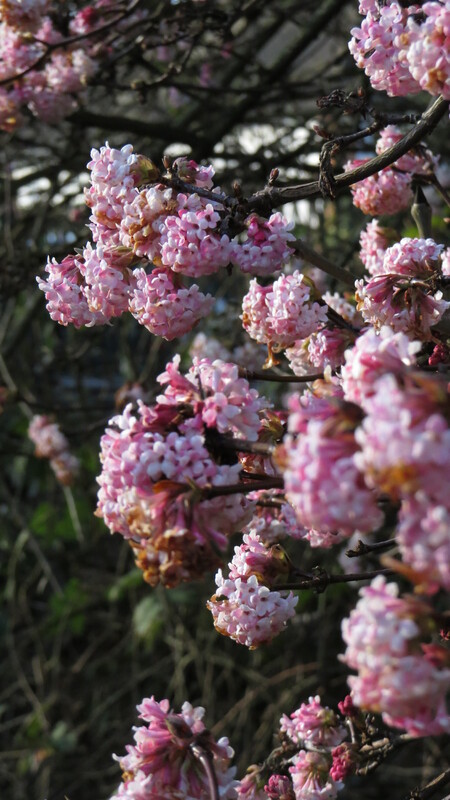 There are two viburnum x bodnantense ‘Dawn’ shrubs, and the scent is divine, even on this freezing day. The pink flowers on the bare branches against the bright blue sky remind me of a Japanese print. By now, I am cold and in need of a loo. And so I cross Meadway, and stop for a coffee in Cafe Toulouse in Market Place. And very fine coffee it is too. This is a favourite stopping-off place for walkers and mums and friends, and I can see why. I love that it’s called ‘Toulouse’ not because of a fondness for France, but because it’s on the site of a former public toilet. 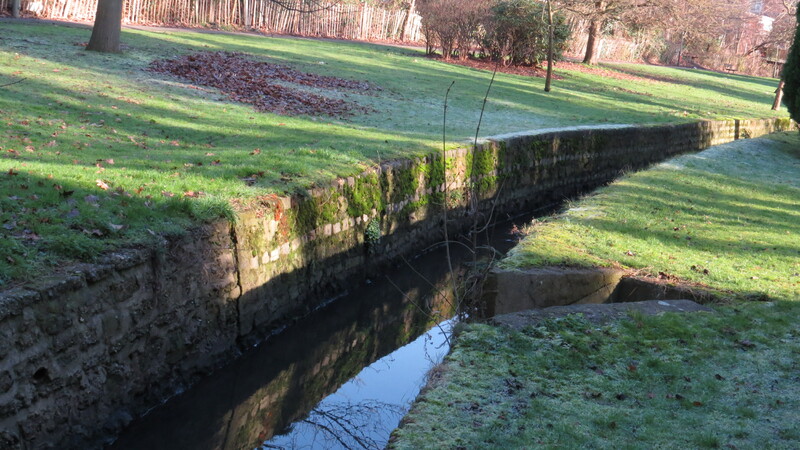 My walk takes me into another little park, where the Mutton Brook still wanders along in a decidedly civil manner. I sense, however, that it is getting more ambitious. Once past the tennis courts it becomes wider and wilder. 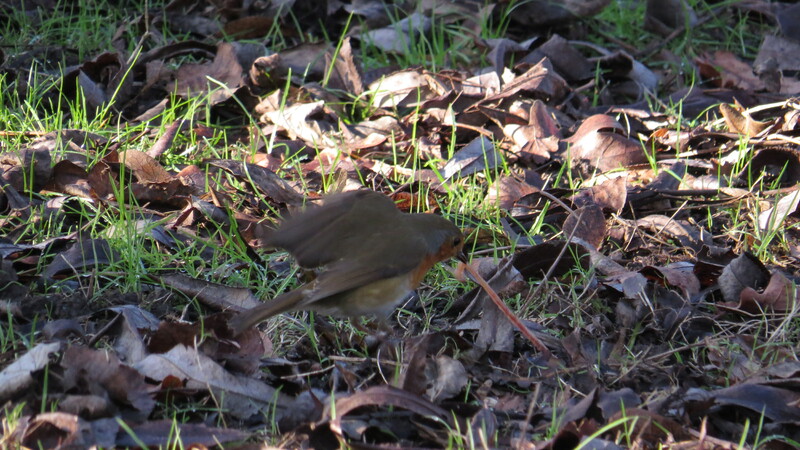 I watch the woodpigeons scuffling through the leaf litter, and observe a robin having a titanic battle with a very resistant earthworm. Who knew that earthworms could put up so much of a fight? 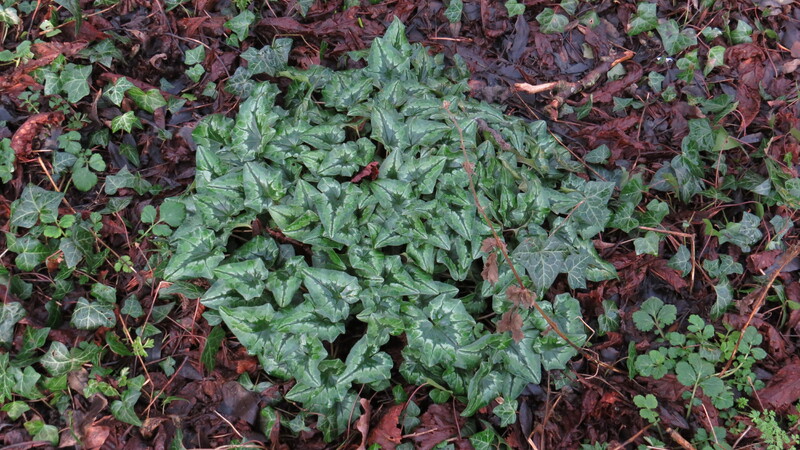 The river is nearly invisible behind the brambles now, and when I go to see if I can see it, I find a fine patch of cyclamen leaves. I can hear the water, but it’s nearly drowned out by the roar of traffic from Falloden Way, a sound that will be my constant companion from now until pretty much the end of the walk. I steel myself to cross the main road, and see where the stream goes next. But for that, gentle readers, you will need to wait until next week. Blog content copyright Vivienne Palmer. Free to use and share non-commercially, but please attribute and link back to the blog, thank you! 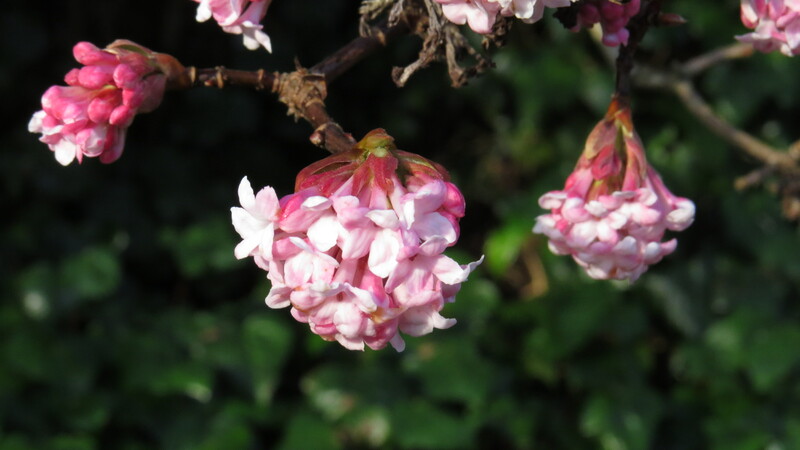 This entry was posted in London Birds, London Places, London Plants on January 21, 2017 by Bug Woman. It looks like a very good identification, Baldwin, tell your botanically minded friend thank you very much! 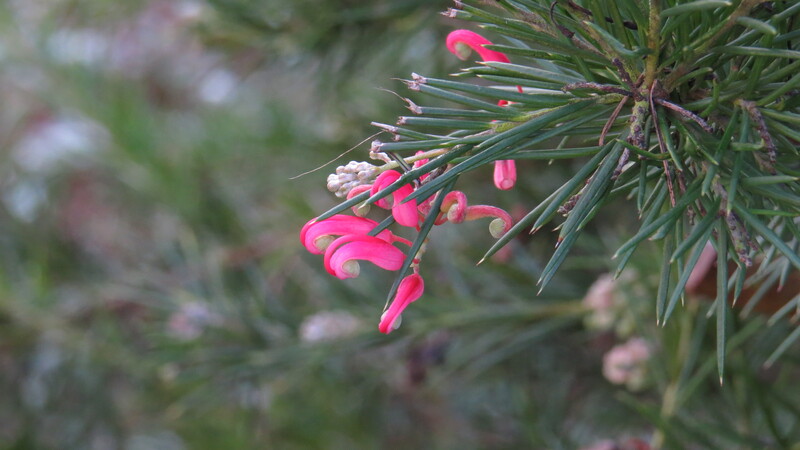 Definitely it is Grevillea I used to grow it but lost it one very wet winter! Thanks for this wonderful journey along your local waterway…it may not be one of the great rivers of the world but is packed full of interesting flora, fauna and encounters! By the way I did once try to find the source of the Thames and was a little disappointed to find a huge dry field with a little wet puddle and a stone plaque! Thank you, Anne, and thank you also for the warning re the source of the Thames. What a disappointment! On the other hand, the estuary where the Thames meets the sea is a very haunting spot. Better to walk from plaque to sea than the other way round I think…. I will dig some Thames head photos to send you by email! The estuary I have never visited but only yesterday finished Rachel Lichtenstein book Estauaty I fully recommend it and now we are planning a visit to discover the wild places of the Essex and Thames coastline! That was a very interesting post and wasn’t Baldwin’s friend helpful? The best I could manage was to point you toward iSpot. I am looking forward to the continuation of this story. 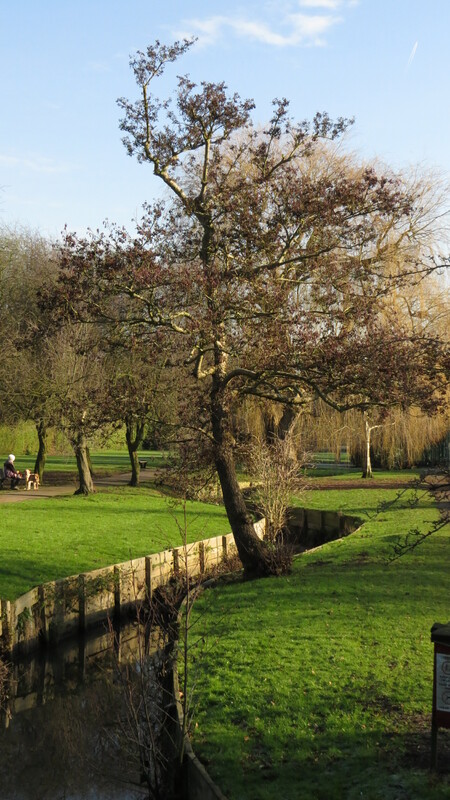 I loved this journey and it has inspired me to walk my nearest river – the Wandle. Fantastic, Ann- let us know how you get on! 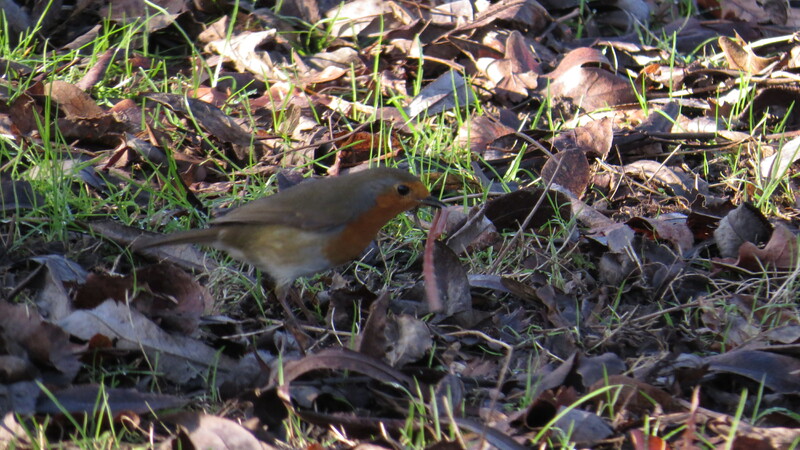 I love these local adventures, you never know what you’re going to find…. A very interesting walk Vivienne, my local river is the Tyne, which would make a very interesting walk, but we also have a number of underground burns that now run under the streets. Now, a walk along the Tyne would be really cool….I might wait until spring though :-). I’m fascinated by true underground rivers too. So many things to investigate, so little time….